It’s not often I update this site in all the time since I’d first built it. But recently, I’ve been making an effort to make some alterations in more ways than one. I’ve become extremely disillusioned with DC Comics ever since 2004 when Identity Crisis marked the beginning of the end of morale and coherency for the shared universe, thanks to the shocking abuse machinated by Dan DiDio, Geoff Johns, Bob Harras and a couple others. Even the “New 52” obviously isn’t going to work if the exact same people who’ve been minding the store since the turn of the century are carrying it out. In fact, it most definitely hasn’t. And one of the biggest victims of this bizarre retcon has been none other than the stars of this site: Hawkman and Hawkgirl. 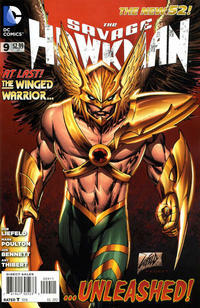 When Rob Liefeld, comicdom’s worst, most blatant artist, was assigned to draw and write the Savage Hawkman, it became pretty apparent to me that even Geoff Johns never cared for the Winged Warriors any more than anyone else in DiDio’s staff of hack writers chosen by pure favoratism. I looked at one of the covers he drew for the most recent iteration of Gardner Fox’s classic creations – one that notably makes no room for Hawkwoman – and I think it goes without saying that I would never post panel scans from Liefeld’s atrocious rendition in the gallery section I put up here. I’m not happy, and I take no pleasure in saying this, but after nearly 15 years since the introduction of Kendra Saunders as a new Hawkgirl who’d host the spirit of Sheira Saunders, and the return of Carter Hall to the spotlight…I’m a lot less impressed with the Johns/Robinson take on the Hawks. I looked again at the 3 paperbacks I’d bought nearly a decade ago and still own as of this writing, and if there was anything that annoyed me there besides too much nostalgia, it was a pointless line by Shadow Thief in the first one (Endless Flight), where, while captured by the slavemongers in the alternate world, he says that he likes capitalism?!? (The implied sexual harrassment of Jayita Sahir was another detractor, easily worse than the former matter.) As a conservative, I take issue with their application of that line to the mouth of a villain and think it's very unhelpful. Mind you, I don’t think Robinson/Johns’ work on JSA and Hawkman is anywhere near as bad as Johns’ solo work on the Flash, which was downright repellant. But like a lot of recent writing contributions for DC and Marvel, it does not hold up well. And now, after Flashpoint obliterated much of that, it’s clear neither Johns nor Robinson valued their ideas much to start with. Another thing I don’t like that comes up in the latter half of the run, where Johns went more solo as a writer, was the references to Extant, the villain whom Hank Hall was transformed into back in 1991’s Armageddon; one of the worst results of a crossover. And it makes no difference whether a specific character is a minor 3rd tier, that’s no justification in any way, shape or form for just turning them into cannon fodder. This is a major offense DC’s editors have been guilty of since that time, and did nothing to improve upon. There’s a lot of potential in 3rd tier characters, both superheroes and recurring cast members, and they have tragically failed to realize that. What's particularly galling is that they would even go by what Zero Hour set up in the first place. I sold off a TPB I once owned of JSA: Darkness Falls more than a year ago because it got to the point where I concluded it was an embarrassment, and didn't really do much to avoid darkness at all. And what was the whole point of turning Obsidian into a whackjob? By far one of the worst ways to go the nostalgia route is to bring in a minor hero just for the sake of turning him insane. I decided this just wasn't something that had everlasting value to me, and parted ways with it. And I feel all the better for it, no joke. Johns shares a bit in common with J. Michael Stracynski, an equally overrated writer who denigrated Spider-Man, and whose defenses that he wasn’t responsible for everything that transpired I don’t buy. He has a built-in audience much like JMS that can take to his work based on name attachment only, and abandon the series he worked on after he leaves. Proving even they never had much care about the series and characters he’s worked on to begin with. Johns also threw Kendra away during Blackest Night in one of the worst ways possible, and much as like to think that Sheira reappearing would be great, Kendra’s demise at the time was uncalled for. In any case, Johns’ repellent knack for sensationalized violence is just what makes it impossible to appreciate his work, far more than his overeliance on nostalgia. I’ve recently decided to make an effort to downplay and remove content like pictures from this website that date past early 2004, and replace it with pictures from older, better stuff from the days gone by. Golden, Silver and Bronze Age stuff is what I’m practically seeking now as paperbacks for my comics collection too. It won’t be easy, but I hope someday I’ll succeed in finding the Golden Age Hawkman stories in DC archives, and can afford it too. Because that’s the real treasure trove, and not the stories modern writers/artists don’t even value much. I also removed a review I once wrote of a 2002 Flash issue where Hawkman guest-starred. I no longer stand by my opinion of that tommyrot, and one day I hope to buy and read something older that can make a good replacement review for what I cannot and will not keep on this site any longer. There is still newer stuff on this site I’ll keep around, perhaps wisely, if only because it reflected how I felt years ago. But as of now, the site is mainly dedicated to older material prior to specific cutoff dates. And I’m not going to be giving Johns a place of honor on the list of writers and artists here, nor Rags Morales, mainly because of his part in illustrating Identity Crisis, something he still hasn’t apologized for. Because truly speaking, they haven’t earned it at all. This isn’t something I’m happy to say. No matter what kind of people are running DC and Marvel today, it’s not great to go through at all. But I’m not going to be doing any favors for people who show little or no respect for the properties they’ve been entrusted with, and act as though they never have to say they’re sorry. I have to take a firmer stance. I can look at myself in the mirror much better that way. So for the forseeable future, the majority of the material here will pertain to the older material about the Hawks and JSA, among other DC cast members. And I think that’s all this site really needs. As of now, it’s still one of the very few fansites still on the web dedicated primarily to the Hawks, and I’m proud to have built when I first did. But many of the stories coming after mid-2004 are a waste of trees, and not something this site should promote. Today, it is my firm belief this site should be devoted to the best possible material about the Hawks, which certainly comes before the turn of the century. Bad storytelling is decidedly not what I’m in the business of promoting. Copyright 2013 Avi Green. All rights reserved.